Canadian lodge experiences, exciting rail journeys and the chance to spot Polar Bears and Beluga Whales are just a few of the highlights featured in Travelmarvel’s latest Canada and Alaska featuring USA Rail Journeys 2017 brochure. Available in Travel Agents from today, the brochure offers three new Canadian itineraries, and three Great Rail Journeys in the USA alongside its incredible portfolio of premium holidays to the region. A new ‘2 for 1 Airfares’ Earlybird offer across select itineraries, which grants couples with one free return economy airfare with Air Canada when they book their holiday and flights with Travelmarvel for a strictly limited time, also features. Alternatively, Travelmarvel is offering a $1,000 solo traveller discount, Premium Economy airfares for $2,595 and Business Class flights from just $5,995 per person. New itineraries include the 21-Day Canadian Wilderness & Alaska Cruise which introduces Emerald Lake Lodge and Tyax Wilderness Lodge alongside all the must-see locations in order to further enhance the authentic Canadian experience. On Canada’s East coast, Travelmarvel’s new 17-Day Eastern Delights tour Travelmarvel offers an in-depth discovery of some of the best known sights, including Toronto and Niagara Falls. In addition guests spend two nights at the Sea Crest Beach Hotel in Cape Cod, which in years gone by has hosted the likes of Henry Fonda and Jimmy Stewart. Here Travelmarvel hosts a Clam Bake on the beach. For those wanting to explore by different means, the new 28-Day Canada by Rail with Alaska Cruise combines nine nights in Eastern Canada and eight nights in Western Canada punctuated by a three night VIA Rail journey from Montreal to Jasper in Sleeper Touring Class. Guests also enjoy a two day Rocky Mountaineer experience in SilverLeaf Class and a seven night Alaskan cruise. Guests who simply can’t get enough of Canada’s exceptional wildlife can also choose to extend their holiday in 2017 with the new Lazy Bear Lodge extension which offers guests the opportunity to see Polar Bears and Beluga Whales. The brochure showcases three new Great Rail Journeys in the USA, all of which take in iconic cities and sights while travelling aboard some of the country’s iconic railways. On offer is the Trans America Rail journey from San Francisco to New York City; the Tracks of the Deep South which includes the restored Tennessee Valley Railroad and the Lookout Mountain Incline Railway; and the Las Vegas and Golden West journeys which travels from San Francisco to Monterey and includes the Coastal Starlight and Grand Canyon railways. Cruising remains a popular component of Travelmarvel’s Canada program and guests can choose to sail Alaska’s Inside Passage including a full day at Glacier Bay, or New England itineraries, both of which set sail aboard Holland America Line ships. Rocky Mountaineer journeys on Travelmarvel’s Western Canada itineraries are all aboard SilverLeaf carriages in 2017. The most popular itinerary is the 21-day Reflections of the Rockies and Alaska Cruise. Priced from $8,595** per person, twin share, guests spend 14 days touring the Rockies from Victoria, via Whistler, Blue River, Jasper, Lake Louise, Banff and Vancouver. Guests then spend seven nights cruising Alaska’s Inside Passage aboard Holland America Line’s ms Volendam. Highlights include an indigenous-inspired dinner at the Lil’wat Squamish Cultural Centre to gain insight into the heritage of the local First Nations; a stay at Blue River’s Mike Wiegele Heli Village; experiencing a River Safari to Grizzly Bear Valley, keeping an eye out for bears, eagles and moose; a western-style BBQ dinner at the Jasper Stables; the opportunity to stay at the iconic Fairmont Chateau Lake Louise hotel; and a visit to Grouse Mountain Bear Refuge for breakfast and bear viewing. Included are 40 meals, a guaranteed Ocean-View Stateroom aboard the cruise; a two-day Rocky Mountaineer journey in SilverLearf Service; 13 nights’ premium accommodation; services of a Canadian Travelmarvel Tour Director and tipping, port charges and airport transfers. 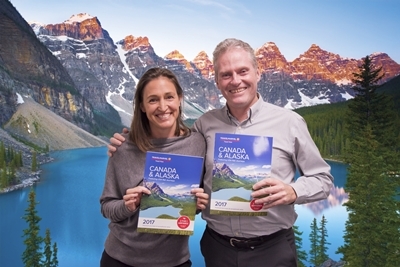 Travelmarvel’s new Canada & Alaska Featuring USA 2017 brochure is available in Travel Agents now.